↑ 1.00 1.01 1.02 1.03 1.04 1.05 1.06 1.07 1.08 1.09 1.10 1.11 1.12 Sylvie Braibant; Giorgio Giacomelli; Maurizio Spurio (2012). Particles and Fundamental Interactions: An Introduction to Particle Physics (2nd ed.). Springer. pp. 1–3. ISBN 978-94-007-2463-1. ↑ Ronald Newburgh; Joseph Peidle; Wolfgang Rueckner (2006). "Einstein, Perrin, and the reality of atoms: 1905 revisited" (PDF). American Journal of Physics. 74 (6): 478–481. Bibcode:2006AmJPh..74..478N. doi:10.1119/1.2188962. ↑ Friedel Weinert (2004). The Scientist as Philosopher: Philosophical Consequences of Great Scientific Discoveries. Springer. p. 43. ISBN 978-3-540-20580-7. ↑ Friedel Weinert (2004). The Scientist as Philosopher: Philosophical Consequences of Great Scientific Discoveries. Springer. pp. 57–59. ISBN 978-3-540-20580-7. ↑ 5.0 5.1 Meinard Kuhlmann (24 Jul 2013). "Physicists debate whether the world is made of particles or fields—or something else entirely". Scientific American. ↑ 6.0 6.1 Zeeya Merali (18 Apr 2012). 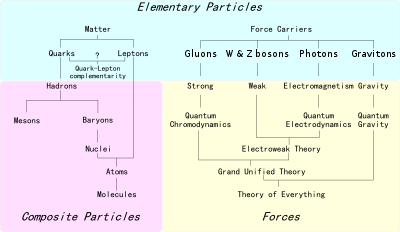 "Not-quite-so elementary, my dear electron: Fundamental particle 'splits' into quasiparticles, including the new 'orbiton'". Nature. doi:10.1038/nature.2012.10471. ↑ 7.0 7.1 Ian O'Neill (24 Jul 2013). "LHC discovery maims supersymmetry, again". Discovery News. สืบค้นเมื่อ 2013-08-28. ↑ Particle Data Group. "Unsolved mysteries—supersymmetry". The Particle Adventure. Berkeley Lab. สืบค้นเมื่อ 2013-08-28. ↑ National Research Council (2006). Revealing the Hidden Nature of Space and Time: Charting the Course for Elementary Particle Physics. National Academies Press. p. 68. ISBN 978-0-309-66039-6. 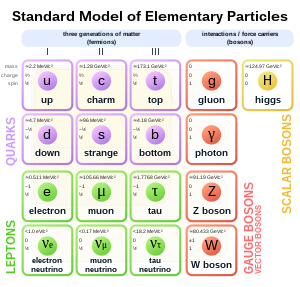 ↑ "CERN latest data shows no sign of supersymmetry—yet". Phys.Org. 25 Jul 2013. สืบค้นเมื่อ 2013-08-28. ↑ 11.0 11.1 Ryan Avent (19 Jul 2012). "The Q&A: Brian Greene—Life after the Higgs". The Economist. สืบค้นเมื่อ 2013-08-28. ↑ Sylvie Braibant; Giorgio Giacomelli; Maurizio Spurio (2012). Particles and Fundamental Interactions: An Introduction to Particle Physics (2nd ed.). Springer. p. 384. ISBN 978-94-007-2463-1. ↑ Frank Heile. "Is the Total Number of Particles in the Universe Stable Over Long Periods of Time?". 2014. ↑ Jared Brooks. "Galaxies and Cosmology". 2014. p. 4, equation 16. ↑ 15.0 15.1 15.2 Robert Munafo (24 Jul 2013). "Notable Properties of Specific Numbers". สืบค้นเมื่อ 2013-08-28. ↑ Lizzy Davies (4 July 2014). "Higgs boson announcement live: CERN scientists discover subatomic particle". The Guardian. สืบค้นเมื่อ 2012-07-06. ↑ Lucas Taylor (4 Jul 2014). "Observation of a new particle with a mass of 125 GeV". CMS. สืบค้นเมื่อ 2012-07-06. หน้านี้แก้ไขล่าสุดเมื่อวันที่ 17 เมษายน 2561 เวลา 02:52 น.